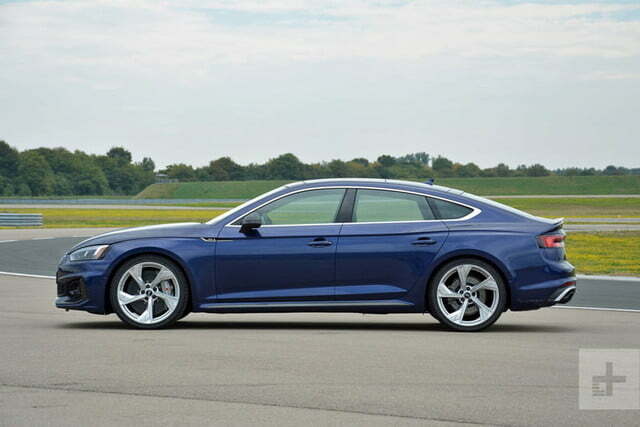 Quick and comfortable, the RS 5 Sportback is a spacious family car that thinks it's a coupe. Audi is done letting its rivals have all of the fun. It’s taking aim directly at the BMW M3 and it’s striking by Sportback. 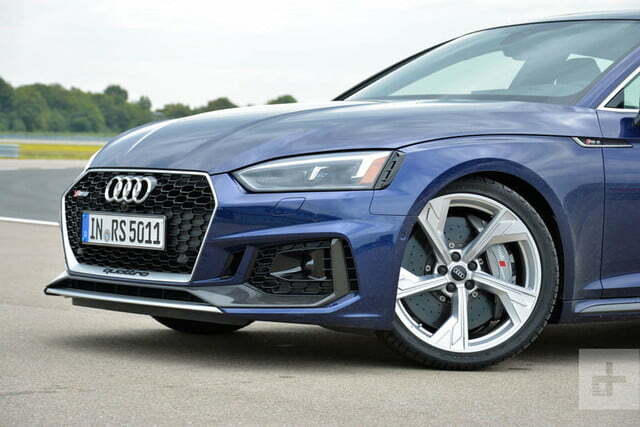 The 2019 RS 5 Sportback – the first of its kind – introduced at the 2018 New York auto show occupies the gray area between high-performance sedans, station wagons, and crossovers with a sporty, fastback-like roof line, a zappy V6 engine, and a surprisingly spacious interior. The Sportback is a one-size-fits-all mono-spec model, meaning Audi doesn’t break the lineup down into different trim levels. It starts at $74,200 before the company factors in a mandatory $995 destination charge. 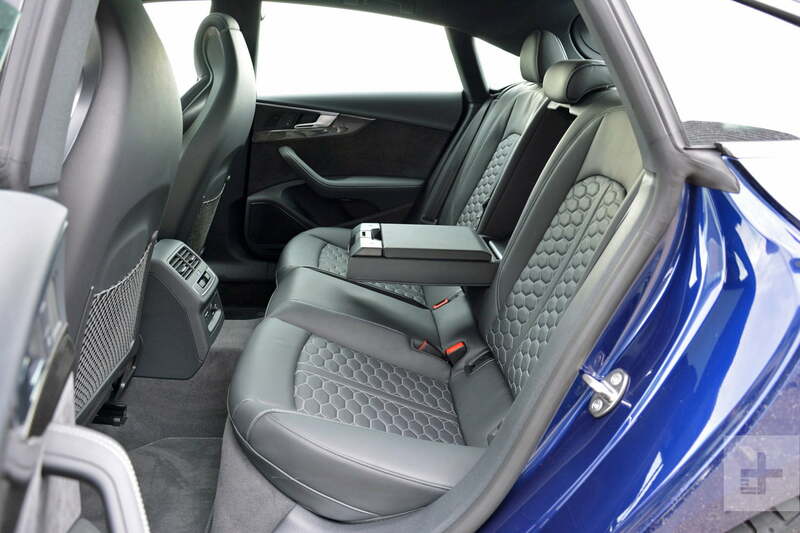 Highlights from the list of standard features include sport seats for the front passengers, carbon fiber inlays on the dashboard, 19-inch alloy wheels, an 8.3-inch screen for the infotainment system, LED lights on both ends, a power tailgate, and a power sunroof. 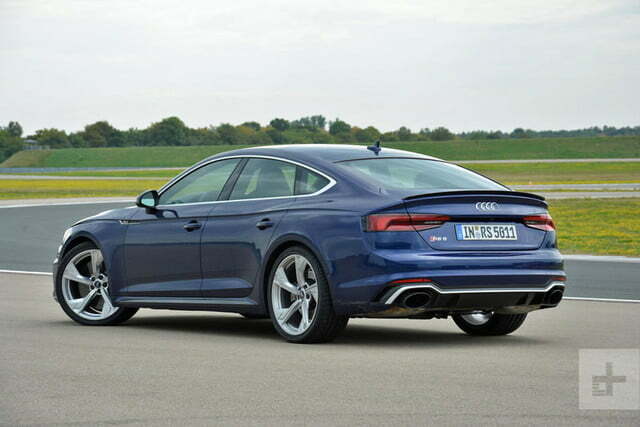 The Sportback is also the final addition to the RS 5 family. Audi offers the model as a coupe, which made its debut in 2017, but Digital Trends can confirm the RS 5 Cabriolet will not return during this generation. 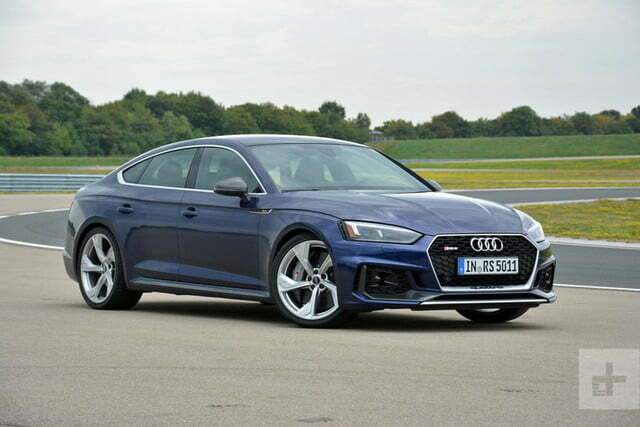 While the original RS 5 offered naturally-aspirated V8 power, the Sportback receives the same twin-turbocharged, 2.9-liter V6 engine found between the fenders of its coupe sibling. As eagle-eyed readers will surely point out, it’s a version of the engine found in the gasoline-electric Porsche Panamera E-Hybrid. Audi politely stressed it designed the six in-house and let sister company Porsche use it, not the other way around as many continually claim. The V8 in bigger models? Now that’s a Porsche engine. Back to the road: in this application, the V6 makes 444 horsepower from 5,700 to 6,700 rpm and 443 pound-feet of torque over a broad range that stretches from 1,900 to 5,000 rpm. Those figures place it between the M3 and the C63, which post 425 and 503, respectively. Power travels through an eight-speed automatic transmission and reaches the four wheels via Audi’s Quattro all-wheel drive system. 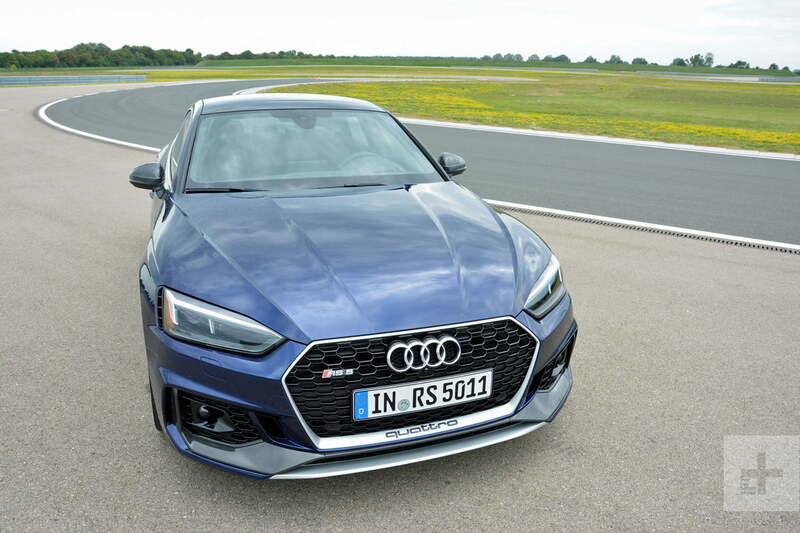 The company quotes a 3.8-second sprint from zero to 60 mph, and it feels every bit as fast after it overcomes a brief instance of turbo lag, but the RS 5 is a corner carver, not a drag racer. We downshifted into seventh gear, gunned it, and effortlessly took the RS 5 to precisely 174.6 mph. Engineers tweaked the suspension – a five-link configuration on both ends – to keep body lean in check and gave the RS sharp, well-weighted steering. That’s par for the course in this segment; we could say the same thing about most of the RS 5’s competitors, including the aforementioned M3. From there, the major difference lies in Audi’s Quattro all-wheel drive system. It balances out the weight distribution while helping the Sportback deliver precise handling that’s predictable and analog without tilting on the boring side of the scale. The RS 5 brings the backdrop to life when let loose on a fast-paced road with a combination of sharp and sweeping turns. The chassis is eager to caper through the bends and the eight-speed rarely puts a foot wrong, though the next gear up or down is just a flick of a paddle away. Battered by jet lag, our co-driver fell asleep in the passenger seat. We courteously cranked the pace down a notch and switched the drive mode selector to comfort, which makes the suspension more compliant, instructs the transmission to hold gears for longer, and tones down the exhaust. The RS 5 is never soft, it’s not capable of that, but the comfort mode softens the suspension just enough to absorb the cobblestones that pave old German towns without disturbing someone napping in the car. It’s an impressive feat that demonstrates the breadth of the personalities baked into the RS 5. The driver can also select a mode named auto, which strikes a middle ground between comfort and dynamic, or create a personalized mode by manually dialing in the settings for functions like the steering ratio, the transmission’s shift points, and the pedal response. An electronic limiter tells the RS 5 Sportback to hold its horses when it hits 155 mph, though buyers who select the optional dynamic plus package unlock a 174-mph top speed. We’d normally list that figure along with other key specifications and move on. It’s often hypothetical. 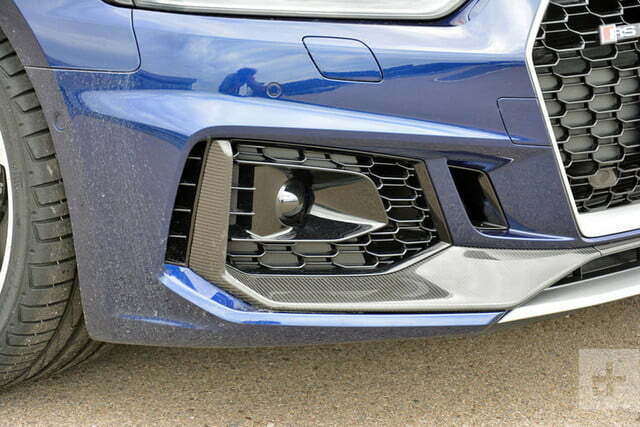 The front carbon ceramic brakes slow the RS 5 down in a quick and controlled manner. How often do you get the chance to drive 174 mph? Not very, we hope, unless you regularly visit a race track. But, since part of our test route took us on an unrestricted section of Germany’s Autobahn, we got a rare opportunity to verify that figure for ourselves. 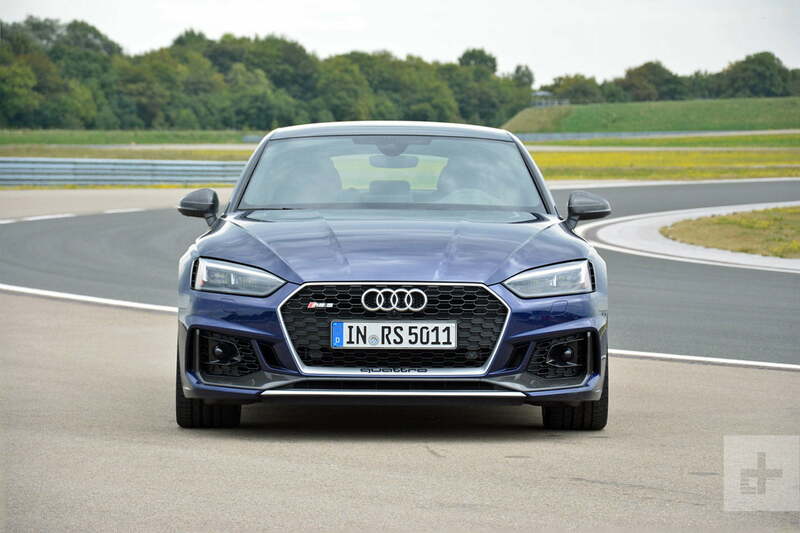 We downshifted into seventh gear – eighth is only for cruising – with a flick of the shift paddle, gunned it, and effortlessly took the RS 5 to precisely 174.6 mph. The six happily flirts with 170-plus speeds but the steering begins to feel vague. We’d bet a more aggressive body kit designed with downforce in mind would easily solve that problem. We didn’t hit the limiter, if you’re wondering, though it would have stopped us had we kept going for an additional second or two. We braked when a yellow Volkswagen Fox nonchalantly drifted into our lane several hundred yards ahead. Carbon ceramic brake discs bigger than the steel wheels on a Mr. Bean-spec Austin Mini slowed the RS 5 down in a quick and controlled manner with a good amount of pedal feel. The “oh crap, we’re going to make a Volkswagen-Audi sandwich” moment never came. Our pants stayed dry. We didn’t spend enough time behind the wheel of the RS 5 to accurately measure fuel economy, and the Environmental Protection Agency (EPA) hasn’t released its official figures yet. 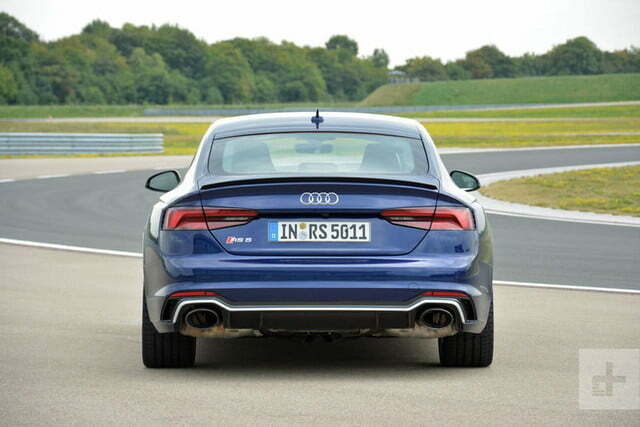 We can confirm that, as expected, the RS 5 empties its tank in record time when cruising at its advertised top speed. We’ve praised Audi’s latest infotainment system, the smartphone-like MMI Response Touch, in the past. It’s one of the best technologies of its kind. 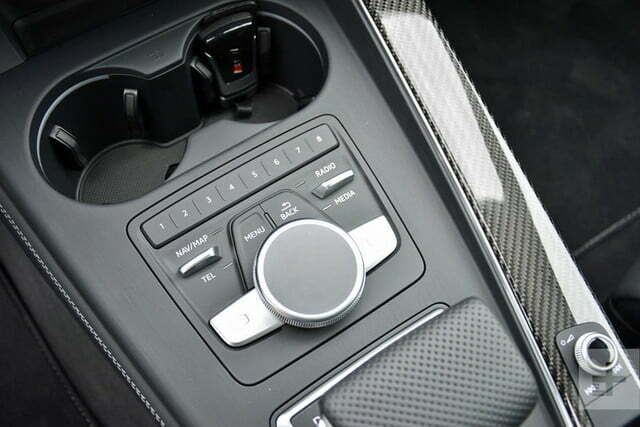 The RS 5 settles for a slightly older system controlled by a thick, coaster-sized dial positioned right behind the shift lever on the center console. The 8.3-inch screen isn’t touch-sensitive so it’s always fingerprint-free but, though it’s widely used, the controller dial isn’t the most intuitive infotainment solution on the market. The driver explores the menus by turning the dial left or right and selects an option by pushing down on it. So far, so good. But, since there’s no pinch-to-zoom option, browsing the Google Earth-enabled map requires moving the cursor using the touch-sensitive pad on top of the dial. It takes a few tries to figure out how much input it needs; we constantly overshot it. We imagine it’s an issue that owners get used to after days, weeks, and months spent behind the wheel but we know Audi can do much better. 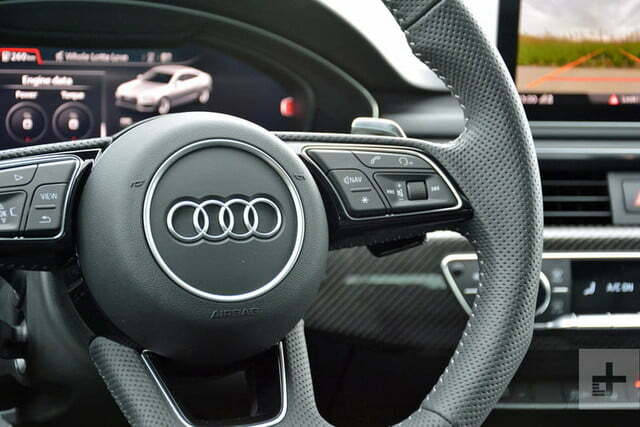 What doesn’t change in the RS 5 is the digital instrument cluster which replaces the handful of analog gauges normally grouped in the panel behind the steering wheel. 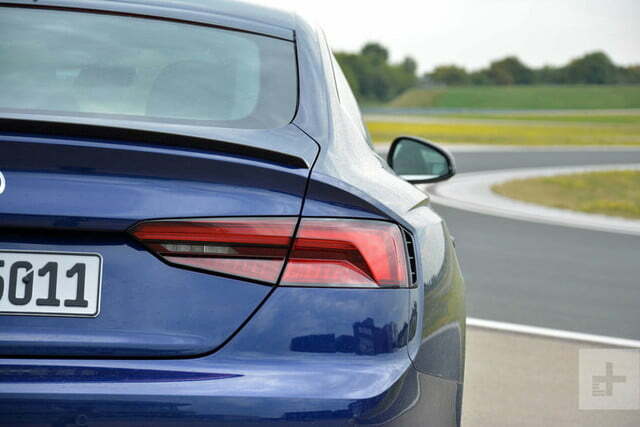 It’s an RS-specific version of the driver-configurable unit found in other Audi models, like the TT and the A7. It shows a variety of information including the speedometer, the tachometer, mechanical data about the car (like the oil temperature), entertainment options, and navigation directions. We found ourselves using it more often than the aforementioned dashboard-mounted screen. When it came to design, stylists drew inspiration from some of Audi’s most prolific historic models. Buttons on the steering wheel allow the driver to quickly zoom in and out of the map, select a different radio station, and change menus entirely. It responds to input almost instantaneously and the graphics are crystal clear. We also like the possibility of displaying engine data like the real-time horsepower and torque outputs and the turbo’s boost. It’s not absolutely crucial to know how much torque is left under your right foot but it’s interesting to glance at as you blast down a country road. Apple CarPlay and Android Auto compatibility both come standard, as does smartwatch connectivity and 4G LTE compatibility. 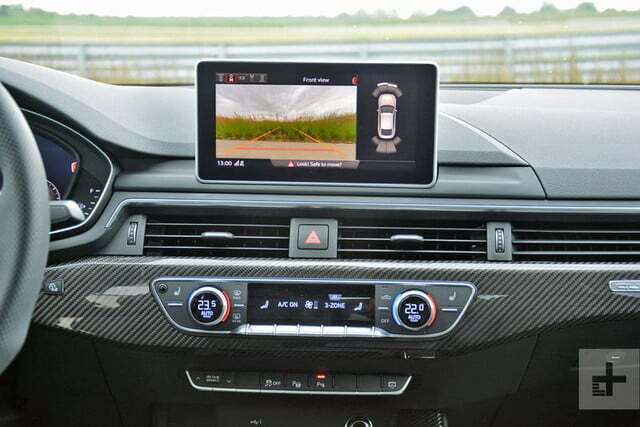 The list of options also includes a head-up display with an Audi Sport-specific mode that includes a lap timer. Both modes offer clear, easy-to-read graphics, even in bright sunlight. Power, handling, and tech only represent part of the recipe. 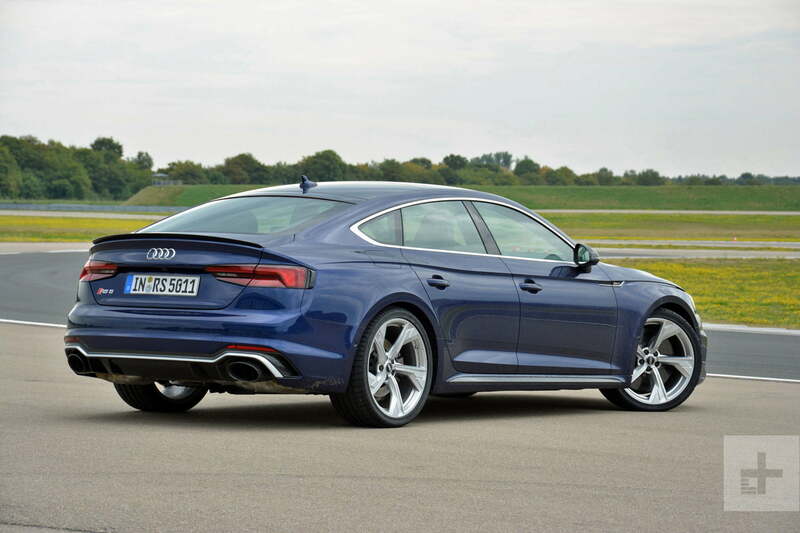 When it came to design, stylists differentiated the RS 5 Sportback from the A5 Sportback it’s based on by drawing inspiration from some of Audi’s most prolific historic models. The punched-out wheel arches create a visual link to the race-winning 90 Quattro IMSA GTO introduced in 1989 and the flame-belching Sport Quattro that dominated the rally scene during the 1980s. Adding width to the body also hints at the all-wheel drive hardware under the sheet metal while giving the RS 5 a muscular, purposeful stance. It’s slightly longer, wider, and 88 pounds heavier than the coupe model. The RS makeover also includes honeycomb inserts in the grille, high-gloss black trim, and alloy wheels specific to the Sportback body style. Overall, it’s not what we would call low-key but it’s not unduly ostentatious, either. Finally, the Sonoma green paint is only offered on the RS 5. Open the driver’s door to reveal a cabin that exists at the intersection of performance and luxury. 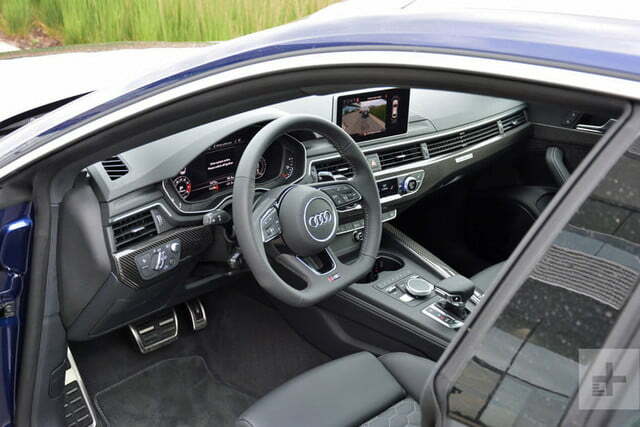 The A5’s driver-oriented center console carries over with RS-specific trim but designers added a flat-bottom steering wheel and leather-upholstered, diamond-stitched sport seats for the front passengers. Since this isn’t a stripped-out, ultra-light track special, the seats are eight-way power-adjustable and they offer a massage function, power side bolsters, plus a memory function for the driver. The RS 5 brings the backdrop to life when let loose on a fast-paced road with a combination of sharp and sweeping turns. Audi made the cabin spacious enough for four passengers, and it’s possible to squeeze a fifth on the rear bench. The hatchback body style comes into play when it’s time to take a trip to Ikea. Keep the rear seats up and you’ve got 22 cubic feet at your disposal. Fold them down and you’re ready for a 35-cube run to the store. To add some context, the Mercedes-AMG C63 – another one of the Sportback’s arch rivals – offers 12.6 cubic feet when it carries four adults. 22 is more space than you get in the outgoing Q3 but a little bit less than in the A4 Allroad wagon. 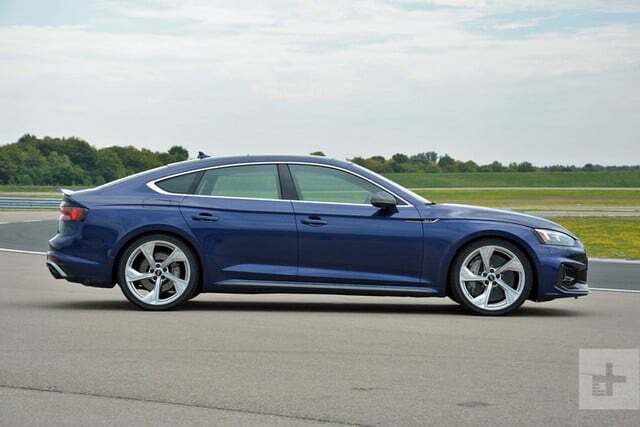 The RS 5 Sportback comes standard with dual front, front side, and side curtain airbags. 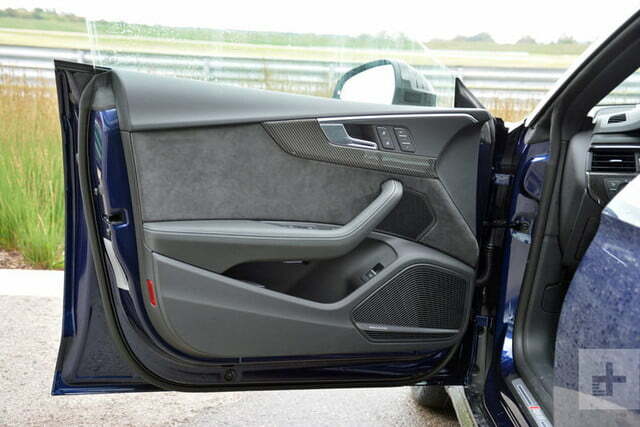 Rear side airbags are offered at an extra cost. While Audi hasn’t released warranty information yet, we expect that, like all of the brand’s new cars, the RS 5 Sportback will come with a limited warranty valid for four years or 50,000 miles, whichever comes first. 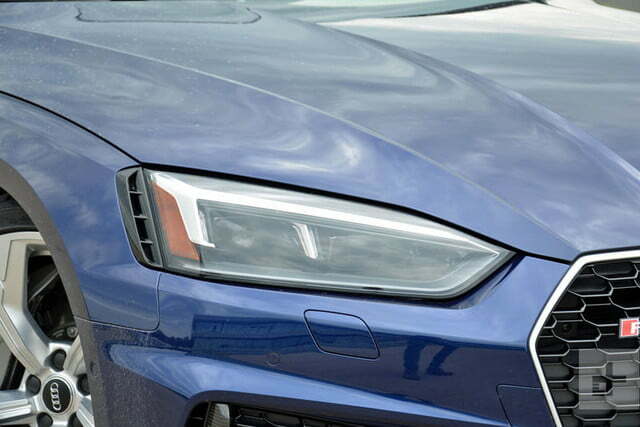 Audi also includes a 12-year corrosion warranty, 24-hour roadside assistance for four years, and it pays for the first scheduled service. Now that the four-door Cadillac ATS-V has retired, buyers in the market for a compact sport sedan need to choose between ravioli and maultaschen. The RS 5 Sportback fights for garage space against the Mercedes-AMG C63 and the BMW M3, two well-honed athletes that represent Stuttgart and Munich, respectively. The 505-horsepower Alfa Romeo Giulia Quadrifoglio, which puts a Milanese spin on the concept of a sport sedan, is also worth a test drive. 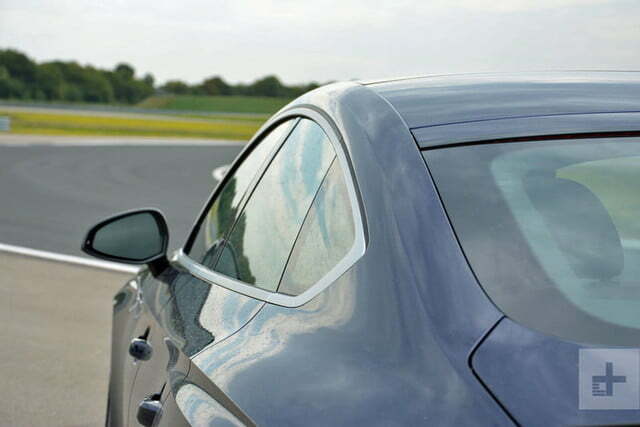 The Audi RS 5 Sportback offers a generous serving of technology. Navigation comes standard, as does the digital instrument cluster. We’d pay extra for the RS driver assistance package, which bundles a head-up display, high-beam assist, and adaptive cruise control, among other features. We’d also add the dynamic package to get the sport suspension and splurge on the Bang & Olufsen stereo with 3D sound. The mechanically downsized, dimensionally upsized Sportback easily finds its place in the RS 5 family. 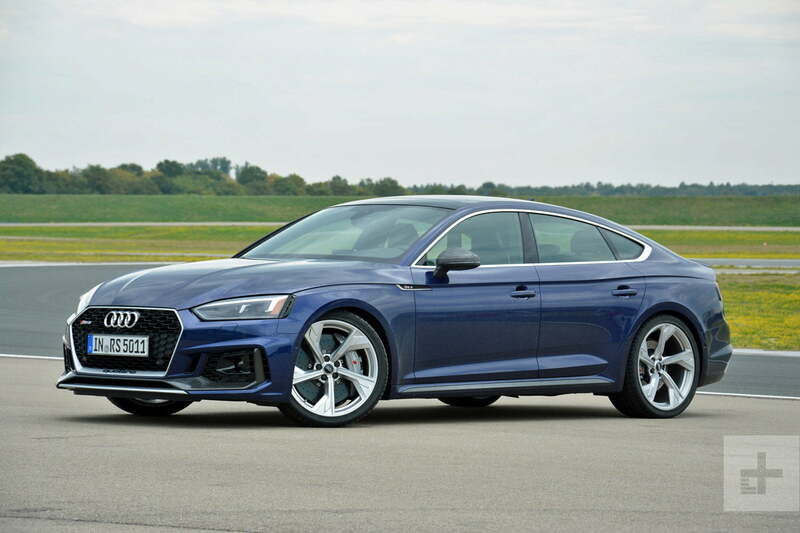 It’s a new species of premium compact sports sedan, one that blends the performance and handling of a coupe with the space, comfort, and tech normally found in a family car. The RS 5 Sportback isn’t as tail-happy as the BMW M3, and its V6 lacks the character of the Mercedes-AMG C63’s baritone V8, but it’s the dapper all-arounder enthusiasts seeking a daily driver will want to choose.